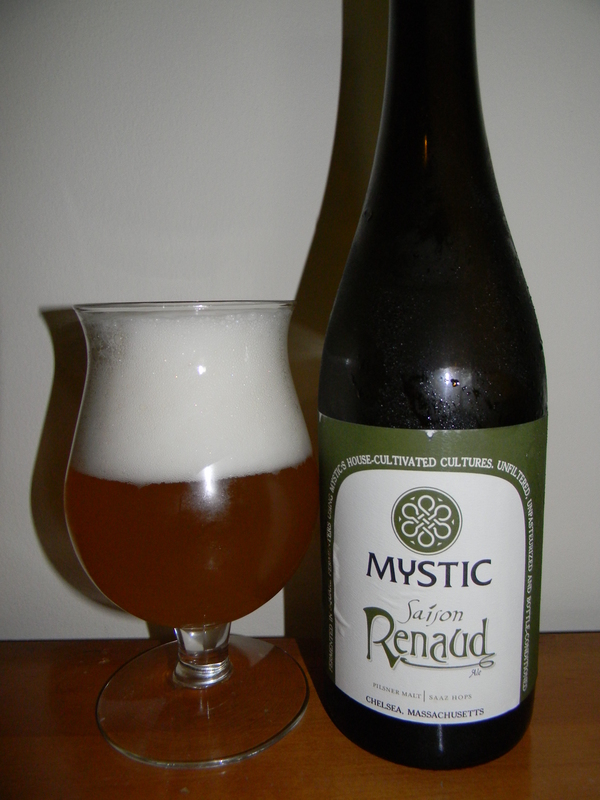 Review of Mystic Saison Renaud | Beer Apprentice - Craft Beer News, Reviews, Interviews and Info. What’s up guys? Thanks for checking back in on another post. For today’s craft beer review I’m going to be trying the Mystic Saison Renaud brewed by the Mystic Brewery situated in Chelsea, Massachusetts. I can’t say that I know much about this brewery, however this particular beer came highly recommended from my local bottle shop, so I had to pick it up. Let’s jump over to the website, mystic-brewery.com, and see what they have to say about the Saison Renaud. A saison for the summer. Made with pilsner malt and Saaz hops…it’s similar to a pilsner with more spice and light fruit. This beer was batch #007. Let’s do this. This brew came in a 25.4 oz. bottle and it possessed an ABV of 6.5%. It poured a hazy, golden/yellow to light orange color. It had a big, billowy, rocky, soapy, white head the had great retention time and some nice patchy lacing. This was a very inviting looking brew that’s for sure. The nose was very, very complex and in-depth. It produced tones of lemon citrus along with hints of hay and grass. It had a beautiful musty funk. It was also quite floral with a subtle waft of white grape, which made it similar to a white wine. I even smelled some green apple and some light spice. The yeast and bready fragrances really began to pop as it warmed and helped tie it all together and give it a solid backbone. This thing smelled great in my opinion. The flavor provided the lemon citrus, which was just a wee bit sour, at first. It was quickly followed by the barnyard funk. The grassy, yeasty and somewhat bready components followed suit, while the peppery spice seemed to be dialed down a bit so just to compliment. The green apple savors came through right at the end. The mouthfeel was medium bodied. It was dry, crisp, refreshing, thirst quenching and bitey. The carbonation was lively, but not stingy. No real presence of warmth from the alcohol, however an excellent shot of flavor was left behind long after each sip. I’ll tell ya. I found this to be a very, very nice brew. It was super refreshing and super easy to drink. It’s definitely one that I would love to have again sometime that’s for sure. Especially next Spring or Summer. Although, I believe I may be able to enjoy this beverage at any point during the year to tell the truth. If you guys see it, don’t pass it up and give it a try. If you enjoy the Saison style I have no doubt that you will enjoy the Mystic Saison Renaud.